Summary - Redesigned food logging feature for a weight loss and nutrition advice app called Asken Diet. What it is - Asken Diet is an app that helps its users better understand their diet & nutritional intake and get advice on how to hit their nutritional goals. 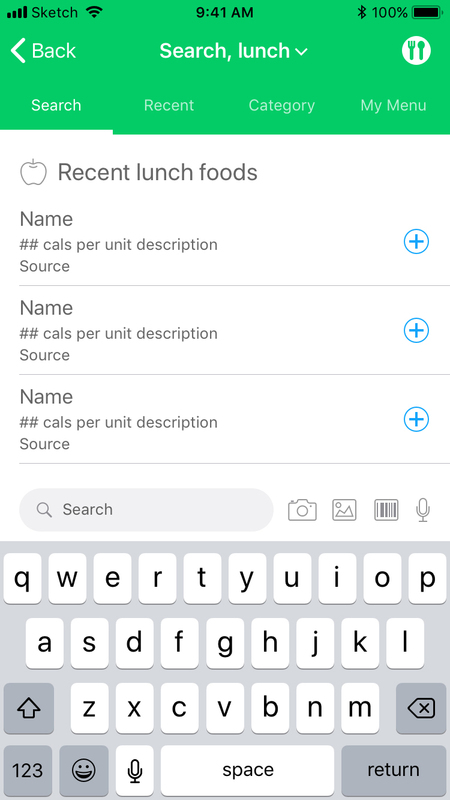 I was tasked with redesigning the food logging flow to: A) increase the number of food items logged per user per week and B) make the food logging flow more flexible and easier for users to log both single items & full meals. How it works - The user must complete five main actions when logging food in Asken Diet: 1) Choosing which meal-of-the-day they’d like to log. 2) Searching for food. 3) Adding food to their Plate. 4) Adjusting serving sizes on their Plate. And 5) Logging the food that’s on their Plate. The lack of metaphor usage in Asken Diet’s old food logging flow felt like a missed opportunity for clarity and was causing confusion. Previously, after searching for food, a tap on a food item would immediately log that food and trigger a congratulatory message pop-up with a notification badge appearing on the utensil icon in the header. This process was good for logging one food item quickly but, what if a user wanted to log more than one food item at once? When the user taps the utensil icon, why does it allow them to change serving sizes after logging, but not before? Getting a congratulatory message with each food item logged seems excessive; is it really needed? I needed to completely rethink the flow. In the real world, people use plates to collect food items before eating. I took this common real world behavior and used it as a metaphor in the redesigned food logging process. Now, a user searches for a food item and adds it to their Plate. They can: remove food from their Plate, search for new food to add to the Plate, create a custom meal from the Plate and edit serving sizes of food on their Plate before logging. It makes for a much smoother, more familiar and flexible process and reduces the number of distracting pop-ups.